Oligodendrogliomas occur most commonly in the dog, but have also been reported in cattle, horses and cats. A 1-year-old sheep with neurological disturbances, including blindness, ataxia, circling and incoordination was referred to the veterinary clinic of Shahid Bahonar University of Kerman. Following euthanasia and necropsy, a soft, relatively well-demarcated mass was observed in the white and grey matter of the right cerebral hemisphere, close to the sylvian fissure in the right cerebral hemisphere. 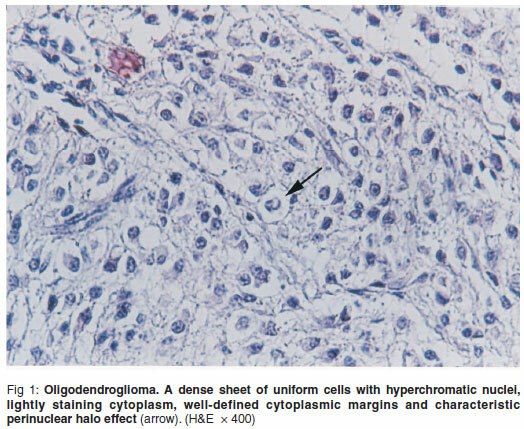 Microscopic examination revealed a sheet of densely packed tumour cells with hyperchromatic nuclei, lightly staining cytoplasm and characteristic perinuclear halo effect which is consistent with a diagnosis of oligodendroglioma. This is the 1st report of oligodendroglioma in sheep. Oligodendrogliomas are derived from oligodendrocytes4. Oligodendroglioma occurs most commonly in the dog but has also been reported in cattle and cats8. Oligodendrogliomas are generally located in the white or grey matter of the cerebral hemispheres, with decreasing frequency caudally from the olfactory bulb, frontal, temporal and piriform lobes to the parietal and occipital areas. They rarely occur in the brain stem or spinal cord4. In humans 5 % of gliomata that arise from the oligodendrocytes are termed oligodendrogliomata7. A 1-year-old male Iranian fat-tailed sheep slowly developed progressive neurological disturbances consisting of difficulty in moving and coordination. It was referred to the veterinary clinic of Shahid Bahonar Universtiy of Kerman. The patient suffered from fever, blindness, ataxia, hypermetric gait, depression, facial paresis, head tilt, strabismus, nystagmus, unilateral loss of menace reflex and circling. Because of the neurological disorders and poor prognosis, the owner elected for euthanasia. Following euthanasia, the animal was submitted for complete necropsy. At necropsy a soft and relatively well-demarcated yellow-greyish mass measuring 0.5 × 0.5×1cm was observed in the white and grey matter of the cerebral hemisphere close to the sylvian fissure (Fig. 1). No significant macroscopic findings were observed in other organs. Brain and representative samples of other tissues were fixed in 10 % buffered formalin and 1 week later the brain was sectioned transversely at 3 mm intervals. These and other tissue sections were routinely processed, embedded in paraffin, cut at 5 µm, stained with haematoxylin and eosin, and examined under a light microscope. Microscopic findings included a cellrich, non-encapsulated tumour, composed of a diffuse sheet of round to slightly ovoid cells. Tumour cells had hyperchromatic nuclei with a variable amount of lightly staining cytoplasm and prominent cytoplasmic borders. The tumour was densely cellular with almost no stroma. A characteristic perinuclear halo effect was created. There were no mitotic figures or necrosis. The tumour was infiltrated by a fine, proliferative microvasculature (Fig. 1). Based on the these histopathological findings, oligodendroglioma was diagnosed. No significant histological findings were detected in the remaining brain parenchyma, spinal cord and other organs. Oligodendroglioma is the easiest of the glial tumors to recognise, even when growing rapidly. Mucinous degeneration, cyst formation, haemorrhage and dystrophic calcification may occur in some of these tumours2,3. There are no clear indices of malignancy, although all must be regarded as clinically malignant2. Sudden unexpected death in a horse due to a cerebral oligodendroglioma has been reported6. The main differential diagnosis that needs to be considered, particularly in a tumour with intraventricular growth is the central neurocytoma, but this rare tumour has so far only been identified in humans. This tumour of neuroectodermal origin has been reported in a French bull dog, a cat, and a Japanese black heifer1,5,9. It seems that clinical signs are mostly due to the space-occupying effect of the tumour3.